I always knew that I had trouble dealing with the cold. I’ve only recently begun to realize how much the cold truly does affect me. Turns out when I’m cold…I’m COLD! Turns out I can’t go outside in winter for any length of time without my temperature severely dropping. The picture above was less than 15 minutes outside with a warm winter jacket. I’d been taking my temperature to see what the trend was. I drop down to 95 degrees Fahrenheit pretty frequently even when I’m in a heated environment. I had begun to think that maybe my thermometer was broken so I bought a new one (the white one in the bottom of the picture). 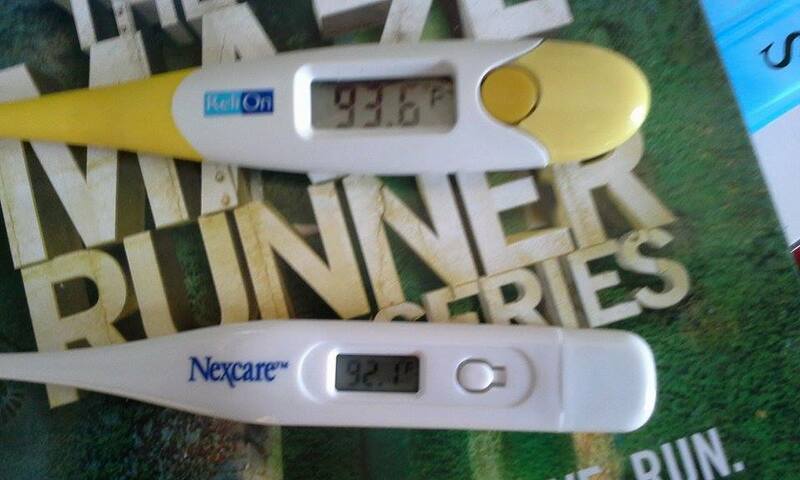 I was really annoyed at first when my brand new thermometer read 92 degrees! I thought I bought a broken thermometer. So I tested it with the older one which read 93 degrees. I was shocked to see that my temperature truly was that low. Crazy. So now I have a new symptom to present to my doctor and a new thing to worry about. Guess I won’t be out playing for long periods of time in the snow huh? Yup, I’m moving south…somewhere warmer..
Weight-loss is a tricky sticky subject. Everyone wants to lose weight until you don’t. And at that point, you really don’t. Heaven forbid that you’re still losing weight though because then all the walls tumble down and open up allowing anyone and everyone to judge you for something. There is no end to the judgement that pours in when any topic about weight-loss comes up. This is a HUGE reason behind why I’ve let my latest symptom just sort of blow over. In the past few months I’ve lost around 10% of my weight. I was hesitant to say anything because 1) I still weight a normal amount (121lbs), 2) I didn’t want to be accused of an eating disorder (seriously, I’ve been obsessed with eating MORE calories just to counteract any future accusations), and 3) I really really don’t want to hear that I should be grateful or that others are jealous or that I should eat more (Really!? Because I am too STUPID to think “Hey, I’m losing weight…maybe I should eat more! Brilliant!”). So completely stupid “eat more” comments aside… it’s horrible that someone can feel scared and vulnerable enough to admit that they are unintentionally losing weight (fully knowing that this is a very weight-loss geared society) and they are told to be grateful. Grateful for what?? Imagine all the possible reasons for losing weight without trying when normally it is so difficult to do. They aren’t pretty thoughts: malabsorption, GI obstruction, organ failure, cancer…etc. The idea that the weight-loss could be due to any one of those reasons is TERRIFYING. And then with any new horrifying thing the question always comes up.. “what will happen to me?” Worst case scenarios run rampant through the mind and they’re hard to tame. So I’m scared. I have seen others with my disorder go through this sort of thing. I’ve seen how they eventually move to a fully fluid diet. And when that fails I’ve seen them get feeding tubes through the nose or directly into the stomach. And when that fails I’ve seen them go to total parental nutrition. All of this is an extremely rare complication of Ehlers Danlos but it happens. It also happens in mitochondrial disorders or metabolic disorders. Or maybe I won the lottery and have a whole new different possibility to deal with. Or it may be nothing. But a 10% weight-loss is a LOT when I’ve done absolutely nothing to provoke/earn it and haven’t weighed this little for years..